Someone once told me that cravings only last for a set period of time and if you manage to deny yourself the craving it will eventually go away. That person was a liar! My cravings don’t dissipate until satisfied. My ridiculously gorgeous, man-eating, sister once told me that if she ever finds herself obsessing over a boy she recalls a single flaw of his that irked her, and then replays that over and over in her mind until she’s rid of her infatuation. While this method may work for getting over crushes, I haven’t been able to come up with a single flaw to cure me of my obsession with French fries or hay smoked salmon belly. My latest obsession is harissa, a North African paste with numerous variations but usually comprised of a mixture of chilies, spices, garlic, citrus, herbs and oil. A year ago I would’ve made my own harissa, but the demands of my current job severely limit my time in the kitchen. Thankfully a good store-bought harissa allows me to serve up food that tastes like I spent hours slaving away when really all I did was open a container. You can pull together a decent plate of pasta in about 15 minutes by simply putting some spaghetti on to boil and throwing a spoonful of harissa into a hot pan with olive oil, thinly sliced garlic and chopped tomatoes (fresh in the summer, canned fire roasted tomatoes in the winter). Once the garlic becomes fragrant and the tomatoes begin to breakdown slightly, just add the al dente pasta and a couple splashes of the salty pasta water. Toss together and garnish with freshly chopped parsley and grated Parmesan cheese. On the weekends when I have a little more time to play with my food I rub harissa paste onto pork loin, and allow it to marinate for a couple hours before throwing the thick cutlets on the grill. 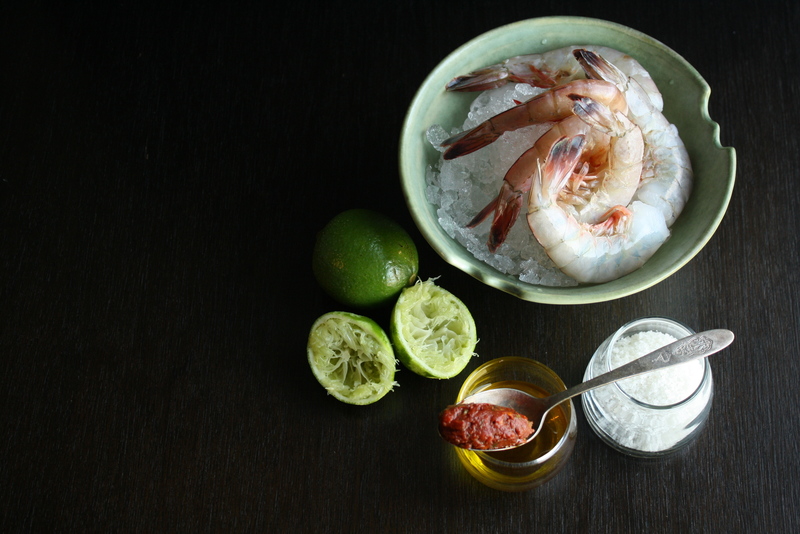 A dozen large shrimp were the latest victims of my harissa obsession. Peeled and deveined but with their tails still attached, I marinated them in a tablespoon of harissa, a generous squeeze of lime juice and a couple tablespoons of olive oil. 20 minutes later they went in a hot pan where they were seared on both sides until they were deeply colored and firm to the touch. 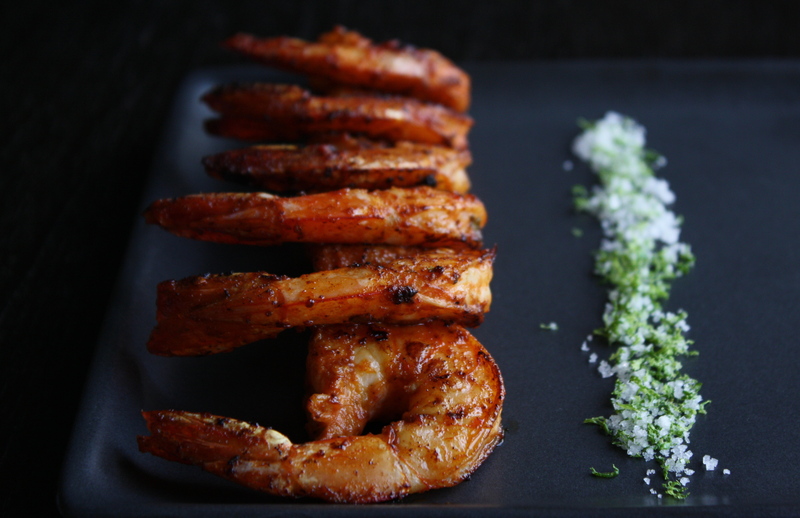 Served with lime salt (lime zest mixed with fleur de sel) these intensely flavored, and coyly spicy bites, brought me no closer to easing my obsession. Perhaps it’s time I learn that occasionally it’s okay to relinquish control and allow oneself to become excessively preoccupied by something that brings pleasure. Harissa has been one of my obsessions this past year too. My husband brings me free sample tubs from his herb company. I use it in soups, on meat, mixed into roasted or steamed veggies………………….. Your husband is a good man! I know which sister you’re talking about.